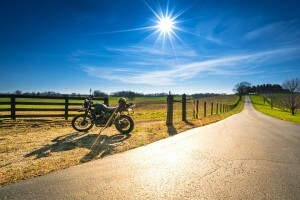 Summer can seem like the best time to ride your motorcycle. However, if you want to do it in a safe manner, you will need to follow the tips in this post to endure the hot temperatures. It seems crazy to think that August is already here! If you haven't started your summer motorcycle rides, however, worry not, as we still have a little ways to go before autumn arrives. But before you head out the door to start riding, read through the post below. In it, you'll find valuable tips on how you can stay safe while riding your motorcycle in the intense summer heat. Call Superior Synthetics LLC at (715) 823-6525 to purchase the most effective synthetic oil in Bear Creek for your motorcycle's engine. Sweat is an inevitable part of every summer experience. As you know, it makes its appearance when your body is getting too hot and needs a way to regulate its temperature. Needless to say, if you'll be spending a lot of time under the sun, riding your motorcycle, it is highly likely that you'll sweat more to cool down. For that reason, you will need to drink plenty of water to replenish your body's liquids and avoid dehydration. As mentioned above, dehydration can happen when you don't drink enough water. However, another danger of riding your motorcycle during the summer is suffering from heat stroke. Both of these can be pretty serious ailments, which is why you should learn to identify them. With that in mind, if you start feeling dizzy, extremely tired, nauseous, very hot, or other, you should visit a doctor to assess your condition. If you've been riding a motorcycle for awhile, you know that to stay protected, you need to wear certain riding gear (like your helmet, your gloves, and a leather jacket). Still, during summer, it may seem like too much. That's why you should search for fabrics that are impact-resistant, and that will allow you to stay fresh during those hot summer days. No matter the weather, however, always wear your helmet and sunscreen. The sun during the summer is the most intense it will be all year. This means that if you want to shield your eyes from its blinding light, you will need to wear sunglasses with UV protection while you ride (if your helmet doesn't have a tinted face shield). This way, your vision won't be compromised by the brightness of the sun during this time of year. It's safe to say that the conditions can be a little bit extreme during the summertime, and that they will make your motorcycle work extra hard. Lest you want your vehicle to break down because of them, you should visit your mechanic at least once this summer. This way, they'll be able to check the tires, engine, and other vulnerable areas, and ensure that they'll be able to work smoothly, even when the temperatures are high. Keep your engine going strong this summer with help from AMSOIL 20W-50 Synthetic V-Twin Motorcycle Oil. Place an order online, or by calling Superior Synthetics LLC at (715) 823-6525. People's moods can be heavily influenced by the weather outside. This is why it is more common to see cranky drivers during summer, as the heat can make them feel uncomfortable and annoyed. As a motorcycle rider, you should try your best to avoid road rage (both in yourself and in others), since you'll be more at risk if you get into a road rage-related accident. To that end, you should go through this post by Allstate to find out tips on how you can stay clear of it while you're riding. As a final tip, remember to pay mind to the weather before you head out for your summer motorcycle rides. By checking the weather forecast, you'll know what to expect while you're out and about (if it will rain, how hot it will be, and more). You will also be made aware of any heat waves that may be coming your way. If upon your consultation, you find that the conditions will be less than ideal, it's better if you wait to ride another day. Purchase AMSOIL's top-of-the-line motorycle maintenance products (like their synthetic oil in Bear Creek), through their online store or by calling Superior Synthetics LLC at (715) 823-6525.